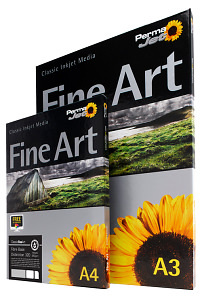 PermaJet have announced a new paper especially for monochrome printing at The Photography Show. 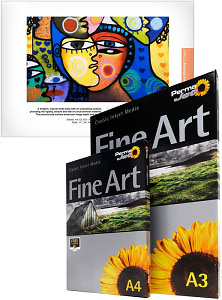 PermaJet has announced new paper surfaces and coating technology for the world's most advanced fine art inkjet media range. PermaJet have enhanced their range of fibre based papers with the latest inkjet technology. Harman has announced that its Direct Positive Fiber Based paper is back in production. PermaJet have announced the withdrawal of two of their papers, with a perfect alternative for them now available. Tecco announce new professional quality photo inkjet papers. Ilford has announced the re-launch of Ilfobrom Galerie FB Matt paper. 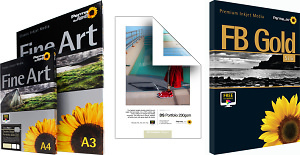 Harman Photo has introduced a new 295gsm RC inkjet paper. Sihl has announced the launch of a new solvent photo paper developed for eco-solvent and solvent inks. Hahnemühle has launched a Photo Silk Baryta paper, an alternative to Ilford Gold Fibre Silk. 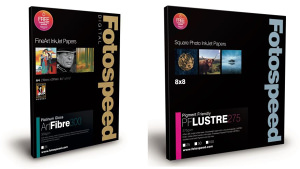 Fotospeed have launched a paper that matches the qualities of now discontinued Ilford Galerie Smooth Pearl Paper.